Human skeletal remains from the wrecks of two British war planes missing for 60 years have been found in Port Phillip Bay in July of 2007. Two divers came across the remains during a recent dive between Mornington and Frankston, the Nine Network reported. The two British aircraft crashed into the bay during a training exercise in July, 1947. Four people were killed but only one body was recovered at the time, but divers Paul Roadknight and Steve Boneham located the remains of one pilot still inside one of the wrecked aircraft about 20 metres below the surface of the bay. They found the remains of another pilot next to the wreck of the second aircraft. There was no information about the possible whereabouts of the fourth victim. The wreckage of the two British Royal Navy single engined Fairy Firefly trainers is considered a significant archaeological find. Mr Roadknight has tracked down the families of the dead pilots and a memorial is planned for next week, on the 60th anniversary of the crash. Britain's Ministry of Defence is believed to support plans not to disturb the pilots' remains. A permanent memorial to the victims could be built onshore, close to the crash site. Heritage Victoria warns that diving near the wrecks is an offence that carries a heavy fine. 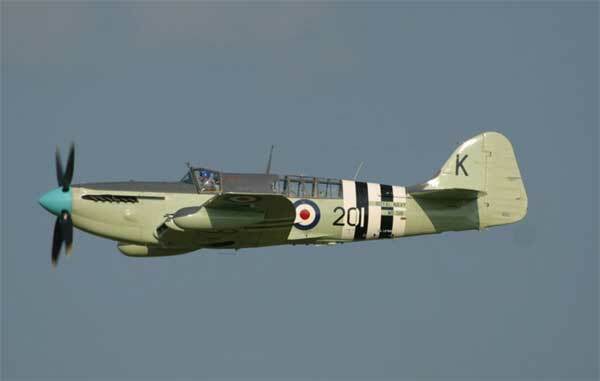 History of the Fairey Firefly. The Fairey Firefly was initially designed under specifications N.8/39 and N.9/39, but the prototype later updated to also fit under specification N.5/40. Designed as a two-seat Fleet reconaissance fighter based on the Fairey Fulmar, the prototype first flew on 22 December 1941. It had a low-wing monoplane configuration with a wide-track undercarriage, smaller than the Fulmar, and provided with a more powerful engine, a single 2,250hp Rolls Royce Griffin 74 engine. The design was deliberately conventional, to bring it into service quickly, and with the trailing edge provided with patented Youngman flaps for use at low speeds and in cruise. Unlike the installation on the Barracuda, these flaps could be recessed into the wing.. Early Fireflies had a deep 'beard' radiator, later models had wing leading root intakes. The aircraft went into production on 26 August 1942 and the first production aircraft was delivered from Fairey’s Great Western Aerodrome (now London Heathrow International Airport) to RNAS Yeovilton on 4 March, 1943 where the first operational squadron, 1770, was formed in October, 1943. A total of 1623 Firefly were built. It was mainly used as a carrier based anti-submarine, reconnaissance and strike aircraft, with a crew of pilot and oberver. The plane carried four 20mm guns mounted in the wings and sixteen 60lb rockets or two 1,000 lb bombs. The Firefly was regarded as a versatile aircraft, taking part not only in WWII but also in the Korean war. The last of the 1702 built was delivered in 1956. The Firefly ended its naval career as a target drone. The Fairey Aviation Company's original prototype first flew in 1941 and, two years later, the aircraft became operational with the Royal Navy Fleet Air Arm. In total, 1623 Fireflies left the assembly lines. One of the aeroplane's most interesting features is the housing of the pilot and navigator/weapons officer in separate compartments. In addition, the innovative wing flaps, when extended, increased both the wing area and, in turn, their lift. This last feature made the heavy Firefly docile during landings on aircraft carrier decks. Two-seat reconaissance fighter. It was a low-wing monoplane with a wide-track undercarriage, smaller than the fulmar that preceded it, and provided with a more powerful engine. The design was deliberately conventional, to bring it into service quickly. Early Fireflies had a deep 'beard' radiator, later models had wing leading root intakes. The concept of the two-seat fighter may have been mistaken, but the Firefly was a versatile aircraft, taking part not only in WWII but also in the Korean war. The last of the 1702 built was delivered in 1956. The Firefly ended its career as a target drone. Postwar the Firefly was used by the Naval Air arms of Australia, Canada, and Holland. The Royal Canadian Navy employed 65 Fireflies of the Mk AS-5 variety on board its own aircraft carriers between 1946 and 1954,m for use in the anti-submarine role. The Royal Australian Navy operated Fireflies in 816 and 817 FAA squadron, with Firefly FR.I, Firefly NF.I, Fairey Firefly FR.4, Fairey Firefly FR.5, Fairey Firefly FR.6 between 1945-1948. 816 and 817 served onboard HMAS Sydney, or shore based at RANAS Nowra (HMAS Albatross). Firefly were also used for training at Albatross by 723, 724, 725 and 851 Squadrons. ASH scanner to port and fuel to starboard. 160 built, first flight 1944. AS.Mk 7 Griffon 59 engine, first flight October 1951, beard radiator. Limited producton. In 1954 whilst serving as a Lieutenant Commander in the RAN Carrier Flagship HMAS Vengeance, I was squirted off the catapult in the back seat of a Fairey Firefly. The aircraft on leaving the catapult dipped below the ship's bows before gaining height, one almost greyed out with the speed the aircraft is launched, of course on our return we needed to follow the orders of the Batsman bringing us down to land on the flight deck and engage the arresting wires with our hook. The Firefly was then brought to a sudden halt. All in all a unique experience for a Seaman Officer, I was rather glad I was not an airman having to endure catapult take offs and flight deck landings on a regular basis.